NETWORK FINALS: The NCAA CHAMPIONSHIP adjusted to 7.1, down a full 2 points from the last broadcast airing in 2015 (although up 1.2 from last year’s cable telecast). The timezone adjustment also pushed the BIG BANG THEORY rerun down to 1.2. 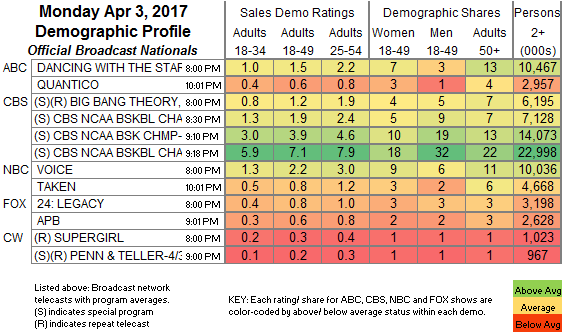 In addition, NBC reshuffled by 0.1, with THE VOICE up and TAKEN down. CABLE HIGHLIGHTS: The big game on CBS didn’t hurt hurt all networks equally. In fact, USA’s WWE telecast was at 1.46/1.44/1.38, way up from last week’s 1.22/1.17/1.14, followed by a WWE HALL OF FAME special at 0.45. On VH1, LOVE & HIP-HOP lost 0.22 from last week’s scorching number to 1.42, HIP-HOP SQUARES was at 0.82/0.73 compared to last week’s 0.95/0.86, and THE BREAKS was down 0.04 to 0.50. On Bravo, VANDERPUMP RULES lost 0.09 to 0.60, SOUTHERN CHARM returned at 0.47, and SWEET HOME OKLAHOMA was down 0.05 to 0.22. A primetime ESPN MAJOR LEAGUE BASEBALL opening day game was at 0.40. A&E’s BATES MOTEL dropped 0.05 to 0.40. 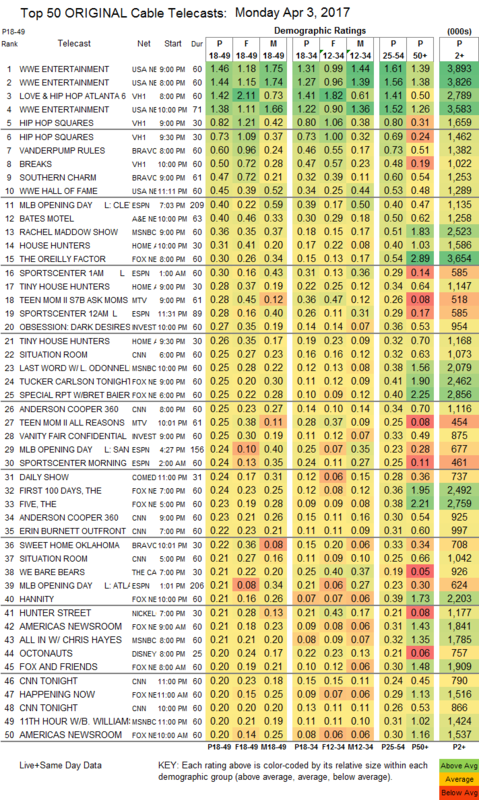 On HGTV, HOUSE HUNTERS was at 0.31, and TINY HOUSE HUNTERS was at 0.28/0.26. On MTV, TEEN MOM aired an “Ask Moms” special at 0.28, compared to last week’s 0.51 special, and then an “All Reasons” special at 0.25. On Freeform, YOUNG & HUNGRY fell 0.03 to 0.19, BABY DADDY was down 0.08 to 0.17, and THE TWINS dropped 0.05 to a dismal 0.04. Food Network’s KID CHEF NATION was at 0.13.